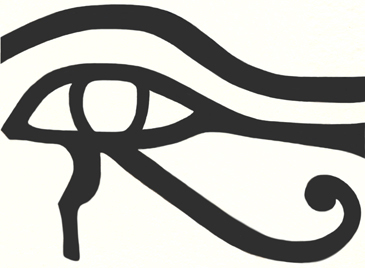 It is apparently not actually factual that the Egyptians used portions of the Eye of Heru to represent major fractions, at least according to Wikipedia. One doesn’t have to literally take the eyebrow as an eighth, the pupil as a quarter, the trailing tear as a sixty-fourth to learn the truth. The eye of Heru used as a sacred amulet, the protective udjat, is the one which was wounded, that which was torn out in conflict with Set, which was (along with Set’s testicles, which suffered similar injury) restored by the powers of Djehwty. This is the eye which was broken, the moon eye which fades and comes back into wholeness. The fractions add up to sixty-three out of sixty-four. It is greater than its visible portions, its undamaged parts considered separately. This is the secret of the udjat eye, the eye of Heru: that the greater wholeness is the one that emerges from incompletion, the greater health is that which has shown itself greater than the damage it has suffered. This is the symbol of a perfected imperfection, its mathematical suggestiveness of incompletion no more than a guidepost to that which is within. It is not unbrokenness that is most mighty; it is restoration. That which has been remade is greater than that which was never wounded. This entry was posted in Guide Artwork, Mysticism, Symbols.